This is the Lockheed JetStar: Four pure-jet Pratt & Whitney powerplants deliver peace of mind as well as power. And the engines speak softly because they are mounted on the aft fuselage—where their noise is behind you. You cruise at 500-550 mph, up to 45,000 feet high—far above the weather. Fly to a nearby city—or another hemisphere. Take off or land at more than 1,000 airports in the United States and Canada —and hundreds more in South America and overseas. 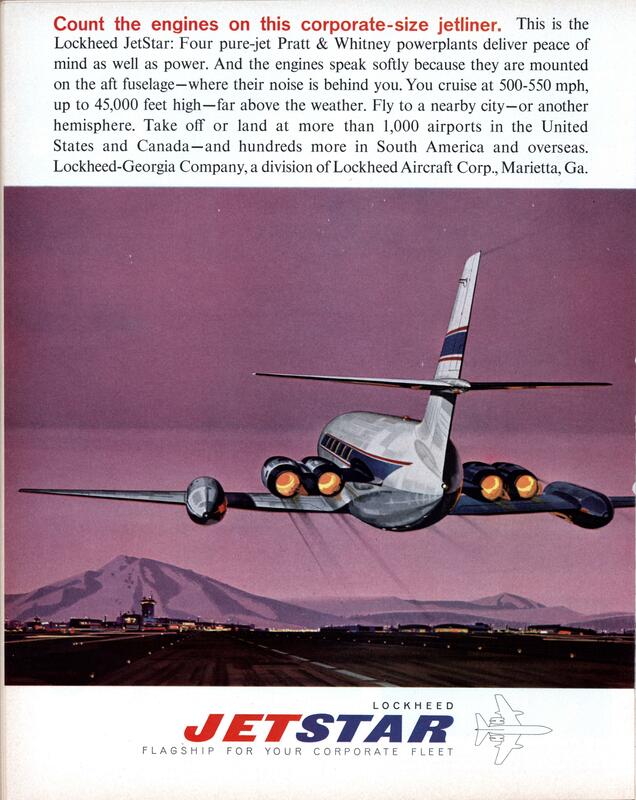 Lockheed-Georgia Company, a division of Lockheed Aircraft Corp., Marietta, Ga. In the 1980’s I lived north of Hobby airport, I saw a plane simular to this one (or maybe this one), several times a week. It did look neat and odd at the same time.